After the Senate once again failed this past week to repeal ObamaCare with its latest repeal & replace iteration – the Graham-Cassidy bill – ObamaCare will continue as the law of the land until it collapses under its own weight or a Republican president can find a Republican Congress that can successfully fulfill its seven year old campaign promise to repeal ObamaCare which is not likely any time soon. Since it was recognized early on that Democrats would not cooperate with any items whatsoever on the Trump agenda the strategy of the Republican controlled Congress, starting with their first meeting in January, had been to use the Senate process known as budget reconciliation to repeal ObamaCare – actually, more precisely to repeal & replace ObamaCare or in the mind of my Congressman Leonard Lance to repair ObamaCare – the long forgotten original campaign promise was to repeal ObamaCare. Under Senate rules, once legislation being considered qualifies for budget reconciliation it only requires a simple 51 vote majority to pass rather than the usual 60 votes normally required to move legislation forward. In order to use Senate budget reconciliation rules Republicans had to first pass a fiscal year 2017 budget bill (three months after the fiscal year started on October 1, 2016) that instructed two committees to begin work on healthcare reform legislation with the goal of saving federal revenue – this is considered a fiscal goal that qualified any resultant healthcare reform bill to come under the budget reconciliation process, but only for the remainder of fiscal year 2017 – hence Saturday's deadline that lapsed with no repeal of ObamaCare. Senate budget reconciliation rules only allows one legislative priority @ a time to be considered so if the Senate wanted to continue with healthcare reform they certainly could but this effort would preclude the tax reform legislation that will be addressed under budget reconciliation rules once a fiscal year 2018 budget bill has been passed. In summary, the Senate can only consider ObamaCare repeal or tax reform under budget reconciliation – but not both simultaneously. BTW – During the 112th (2011 – 2012) & 113th (2013 – 2014) Congresses the Republican-led House passed 54 bills that would have repealed ObamaCare in whole or in part. The Senate remained under Democrat control until the 114th (2015-2016) Congress so there was much less repeal activity in the Senate than in the House. 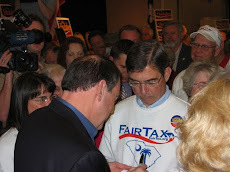 We know from research done in writing previous RTE posts that many centrist Republicans were deceitful & disingenuous when, in January 2016, they supported sending BO a clean repeal-only bill (HR 3762) that they knew BO would veto – Susan Collins is the only current Republican sitting Member of Congress to vote against this repeal-only bill. But not just these congressional centrist Republicans are the problem - this latest episode, under Graham-Cassidy, repeats the pretense of responsibility when we learn that ten governors, led by aspiring national stars John Kasich (Ohio) & Brian Sandoval (Nevada), sent a letter to McConnell in the heat of debate on September 19 asking the Senate to not consider Graham-Cassidy thereby preventing the possibility of block grant money coming their way that would have given governors, like themselves, the final decision on how to manage healthcare in their states – this after years of calling for block grants to do exactly what Graham-Cassidy specified. In other words do your own extensive homework before you believe that any elected representative really has your interest @ heart rather than his own cushy job with autocratic authority over everyone & accountability to no one. See referenced post below for list of congressional names. But while ObamaCare is on the road to collapse with large premium increases & many insurers withdrawing from the exchanges so that 50% of the counties in America will have only one insurance company selling ObamaCare policies in 2018 & another 30% of counties will have only two, the much larger employer healthcare insurance market, that covers about half of Americans, is also seeing large premium increases as well as more & more companies drop coverage for their employees. See the graph below that shows the healthcare insurance cost portion of employee total compensation is increasing every year explaining why wage growth has been smaller than expected in this tight labor market – employees' healthcare insurance contributions have also been increasing, as shown on the graph below, thereby wiping out much of whatever wage increases are received. 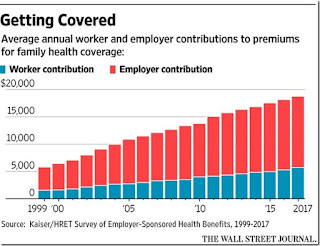 As a point of reference – in the 1990s U.S. car companies spent as much or more money on employee healthcare insurance than they did on steel that went into their cars; today the annual premiums cost more than many new cars with the cost split between workers & employers. In 2017, the percentage of small businesses (3 to 49 workers) that offered healthcare insurance dropped for the first time to 50%. Five years ago 59% of companies in the 3 to 49 worker category offered healthcare insurance. Source – Kaiser Family Foundation. But a large part of the solution to the nation's growing healthcare cost problem, both employer-sponsored plans & Medicare, that threatens to overwhelm the country's finances & federal budget respectively was also revealed in 2017 – namely, 16% of small businesses that did not provide specific healthcare insurance policies did give their employees some money toward purchasing their own plan themselves. 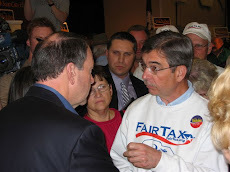 In January 2012 I presented four points (solutions) that highlighted the change in mindset needed to return America to the excellence envisioned & originally followed by our Founders. The first point pertained to Medicare but can equally be applied to the employer-sponsored market today. The idea is to replace the current Medicare plan with one of premium support where the government provides a demogrant for beneficiaries to purchase private insurance – just like the 16% of small businesses did this year in the open market. 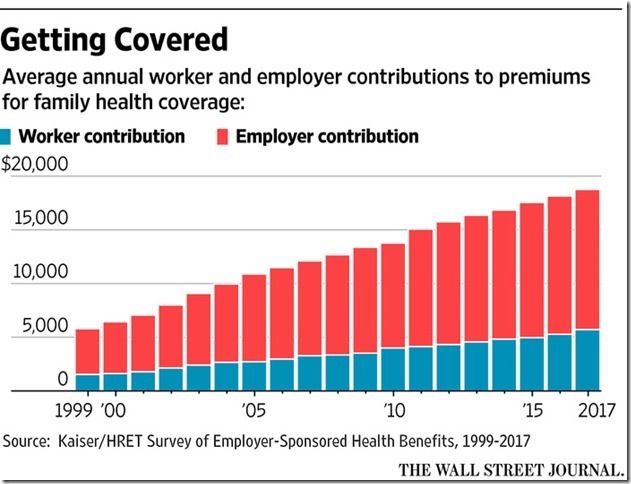 Currently 75% of Medicare Parts B & D are funded by the federal government which compares to 70% of employee healthcare premiums that are paid for by employers as shown on the graph above. In fact it is more than just the one in six small businesses that have started this premium support system. In 2012 Michigan stopped offering retiree healthcare to new employees but instead, in a form of premium support, contributed an additional 2% of salaries to new employee 401(k) plans with the idea that this money could be used for healthcare needs in retirement. Michigan's retiree healthcare liabilities dropped about $20 billion since the program started. As of 2015 U.S. states had a combined retiree healthcare shortfall of @ least $645 billion in addition to $1.1 trillion pension liabilities so the sooner the states start with a premium support system the better. Source of liabilities – Pew Charitable Trust. But most important, ever since the early 1990s many companies, such as IBM, ConocoPhillips, Delta Airlines, & Coca Cola, set ceilings on how much money they would ever pay for retiree healthcare costs. Younger employees can see that their employers will be providing less & less healthcare benefits each year as inflation keeps increasing their share but not their employers'. The setting of a ceiling approach is the key to applying premium support most efficiently in replacing Medicare. See graph below that shows the projected cost curves for several scenarios – only the Ryan Plan – Price indexing plan bends the Medicare cost curve down over time. 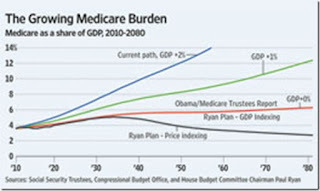 But the premium support Medicare replacement cost curve bends down even faster than the Ryan Plan – Price indexing curve shown on the above graph if the government follows the same approach as IBM & the other companies listed above – namely freezing the demogrant in nominal dollars – unadjusted for inflation into the future. In this way, just like IBM retirees, future retirees will have time to plan for the changes in cost allocation of the premium support system that replaces the current Medicare system thereby once again bringing their own healthcare decisions under their own control. For the past 40 years Medicare spending per capita has been growing @ twice the rate of our economy – see blue line on above graph labeled Current path, GDP + 2%. 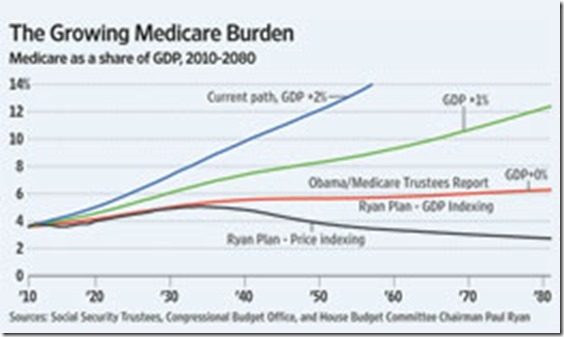 All of the other lines on the graph represent various proposals but all of them, except the one labeled Ryan plan – Price indexing, keep Medicare expenses growing until some point when the cost is unsustainable. The Ryan plan – Price indexing curve indexes the premium support cost to the CPI which will bend the curve down because the CPI rate is less than the rate @ which Medicare has been growing for decades. Freezing the demogrant @ the start of the replacement premium support program that is figured to be ten years hence will give people under 55 years old (no change in the Medicare program for people over 55) time to adjust to the phase in of the premium support program. As each year goes by the nominal dollar demogrant will buy less & less insurance or medical treatment so younger people will start to rely on it less & less. Someone like my 14 year old nephew will not rely on it @ all thereby breaking the dependence on government provided healthcare insurance. The demogrant freeze premium support curve will bend down faster than the bottom curve shown on the above graph. As explained above many companies have moved to such a premium support type system in providing healthcare assistance for their retired employees. Retirees receive a set amount of money to do with as they like regarding medical needs including purchasing insurance or otherwise covering medical & dental costs. Retirees have the ability to make whatever changes they deem necessary in their own personal medical program as their needs change as opposed to a government one size fits all program with government calling all the shots. I have participated in such a premium support system for several years & have seen first hand all the benefits I mention in this post. Many GOP in Congress are incredibly delusional. Their inaction against ObamaCare will lead to their seat losses to Democrats or better yet primary losses to non establishment GOP candidates. I hope for the latter. Nevertheless, probability of GOP loosing one or both houses of Congress increased substantially by leaving OnamaCare alone. It also substantially increased odds of single payer health care within a few years. Congressional Democrats strategy is classic Alinsky like. Attack, no compromise, demonize GOP, excel at extreme lying propaganda to promote their Socialist/Marxist goals. The Dems extreme hatred of traditional America is on full display - especially with regard to the economy- tax reform. The Elite Dems, know that should Trump pass tax reform, that all Americans will benefit with sustained 3-4% GDP growth. But then the Democrats would loose clout with the electorate. So we have delusional GOP and America hating Democrats. The time is ripe for alternative parties with social media, not millions of campaign dollars driving campaigns. I truly hope at least 1 promising party shapes up within next few years. With rise of Independents and 2 parties totally out of touch with the average American, we are ripe for a drastic change in party politics. Stay tuned. Judge Roy Moore is an example of what Economics501 is hoping for. Dave Brat in Virginia too. I see this as evidence that the Tea Party Movement is not dead. I know very little about both. My main wish for the US is to allow private markets that are more free, less regulated and taxed. That I predict will result in sustained GDP of 3-4%, maybe more. Recall capital gains tax decrease resulted in a booming economy during Bill Clinton's 2nd term. Recall Clinton also stated then that the era of Big Gov was over. Too bad most Dems come no where close to Clinton's economic policies of late 90's. Thank you for the explanation of reconciliation. RTE has long promoted a change of mindset in America. I see the benefit of employers changing to a premium support system to help Americans purchase health care insurance or pay medical bills; unfortunately it is an uphill battle with the American public to support this since Americans have been told that they have a constitutional right to health care. The hope is that some companies and Michigan have switched to premium support. Let's see how long other companies and other states take to do the same. Afterall, there are more right-to-work states now so change can occur.